The Property Management module includes a user portal where you can grant access to owners, cleaners, maintenance staff etc. 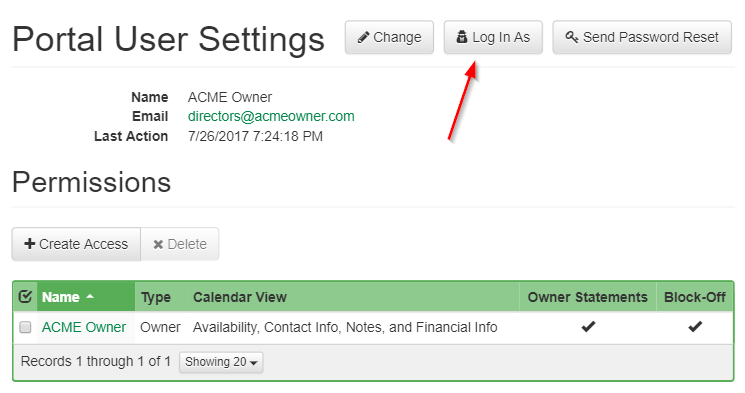 to view availability calendars and perform actions like blocking off time or viewing owner statements. Each user gets a separate login, and you can configure access to one or more properties or owners. Everything is managed in the PM area, in the Portal Access section under Settings. First, create a user with their name and email address. When you create a user, an email will be sent to them with a link they can use to log in and set their password. Initially users won't be able to access any properties or statements -- they can only see what you give them permissions to see. ​Choose the type of thing you want to give access to and then select what the user is allowed to see. You can give users access to one owner or multiple owners, or properties as well -- useful for staff, cleaners etc. 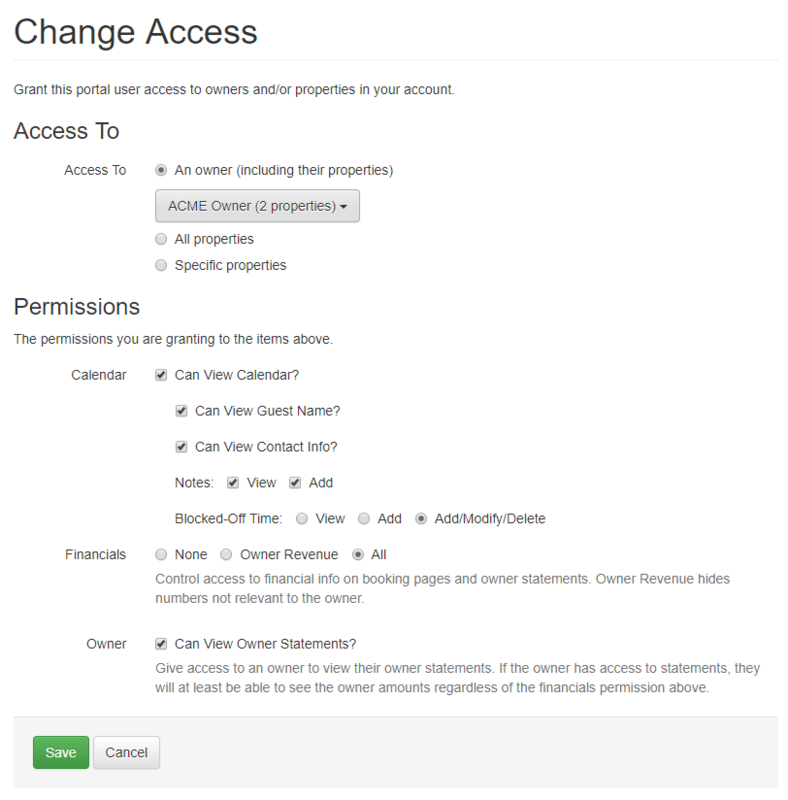 For multiple owners, you'd need to add an access permission record for each. Block off time: allows the user to create a blocked-off time. It will be marked with a Owner Block-Off listing site, and you and third parties will get notification emails. You can also grant access to move/delete blocked off time. View Owner Statements: if you're granting access to an Owner in the system, allowing this will let them view any owner statements that have been generated. Once you've configured the permissions, they'll be able to log in and see what you've given them access to. The "Last Action" item tells you the last time the user has logged in or blocked off time. Useful to make sure they were able to get in successfully and are keeping up to date on the system. If a user forgets their password, you can use them the Send Password Reset button to send a email with a password reset link. If you want to edit access for a user, you can drill in to each permission and change it. To remove access from a user, select the access and delete it.